Our reservation was for 11:30, the opening time of the restaurant. We checked in a few minutes early and I asked if we could be seated at a table next to the water. While we waited for them to start seating the guests, I took a quick picture of the Lunch menu posted out in front by the restaurant entrance. Then I was very happy when my request to be seated by the water was granted. Allison and I started by ordering a margarita. Avocado Margarita – El Mayor premium silver Tequila, melon liqueur, fresh avocado, agave nectar and fresh lime juice, served frozen with a hibiscus Himalayan salt rim. 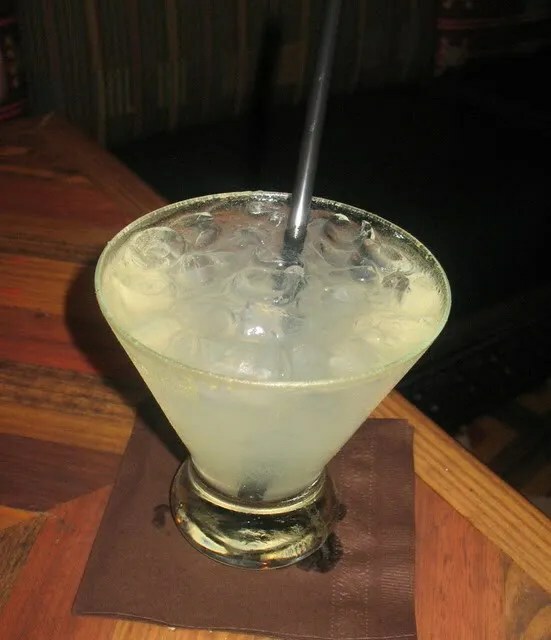 Wild Passion Fruit Margarita – Familia Camarena premium silver Tequila, ginger liqueur, passion fruit, mango nectar and fresh lime juice, topped with fruit foam, served on the rocks with a hibiscus Himalayan salt rim. 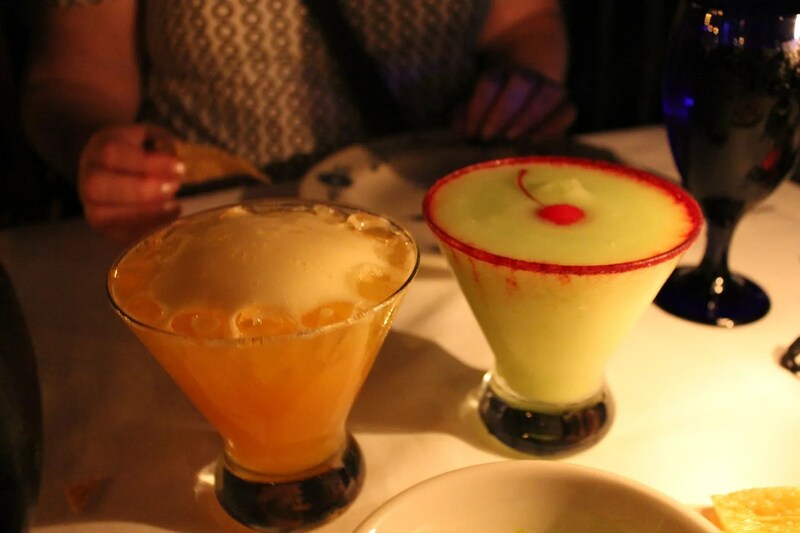 I of course had the Avocado one (on the right) and it was again delicious…sweet and fruity, just as I like my margaritas! And in case you have never tasted this, it tastes nothing like avocados, IMHO. To me, it actually kind of tastes like bananas??? I know that sounds rather odd…a green colored drink that tastes like bananas, but I highly recommend it! Allison has a goal to try all of their different margarita flavors, so she ordered one that she had never had (this was #5). She gave the Wild Passion Fruit Margarita a “Good” rating, but it wasn’t her favorite. So which is her favorite so far? 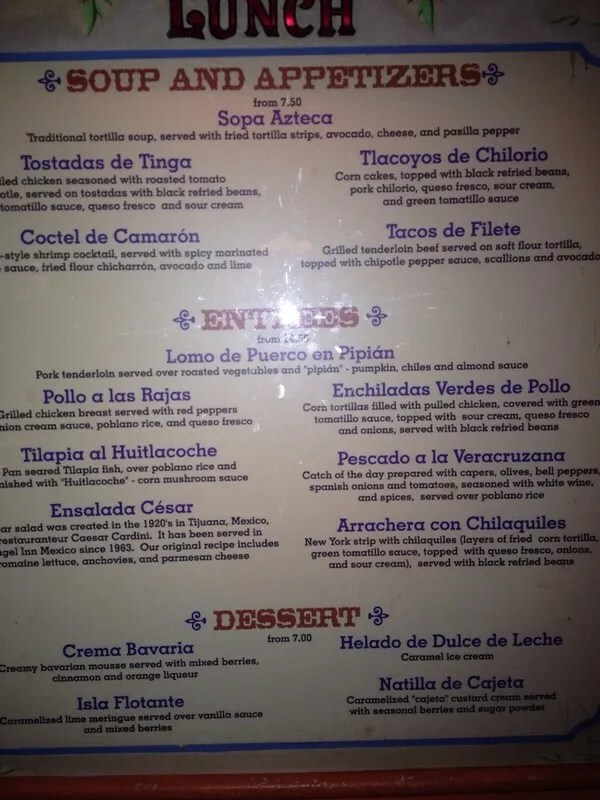 She had this at La Cava on her last trip. I thought it was kind of boring, but she really enjoyed it. Okay, how about some food now??? 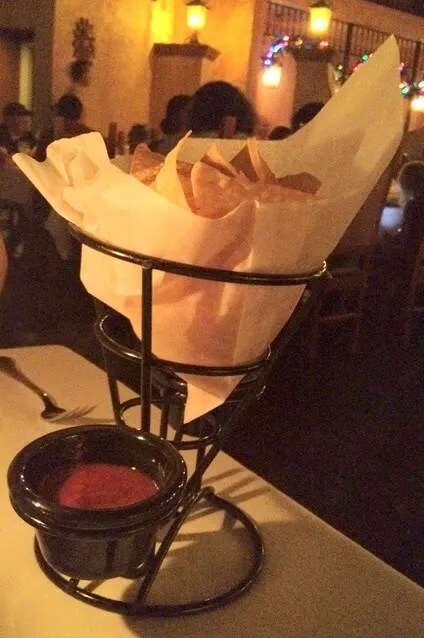 Just like on my last visit to SAI in November, I again did not like the salsa that is served with the chips. It has a very smoky, barbecue flavor that I (and the girls) did not care for. 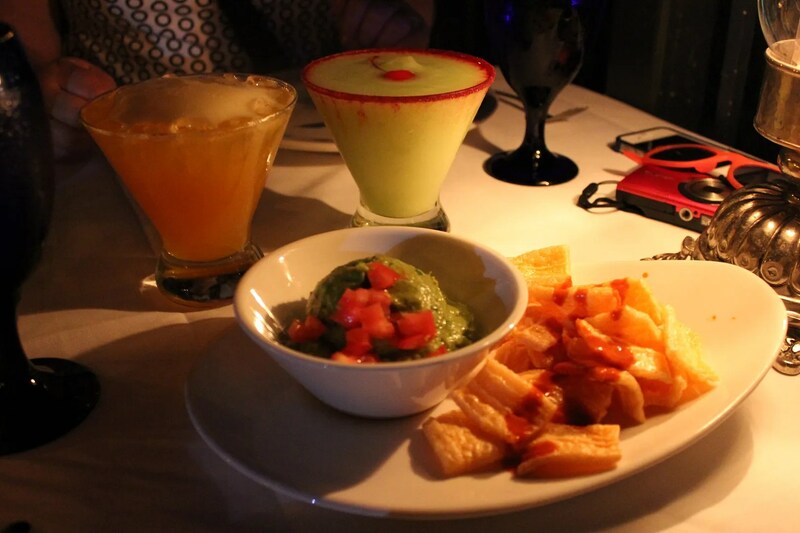 We all enjoyed the guacamole with both the chips and the chicharrones that came with it and gave it a rating of “Good”. 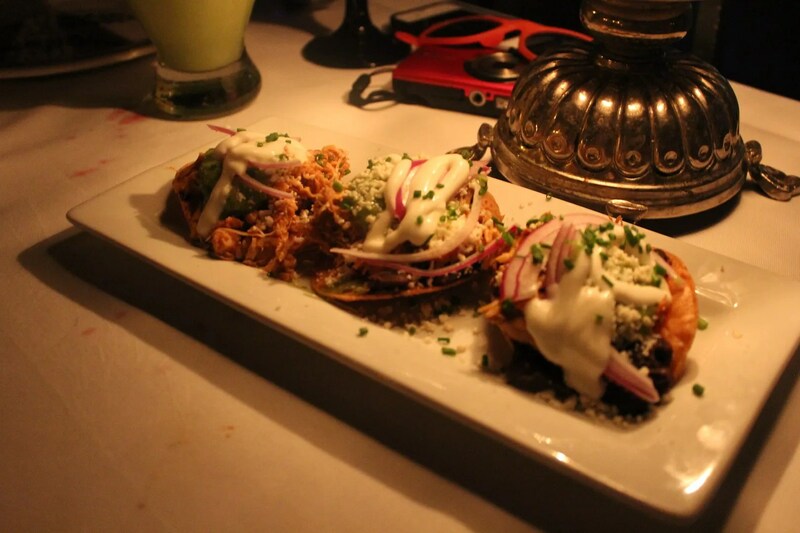 Tostadas de Tinga -Pulled chicken seasoned with roasted tomato and chipotle, served on tostadas with black refried beans, green tomatillo sauce, queso fresco and sour cream. I really love these and could have easily eaten all three and called it a meal, but the girls really like them too. Darn it! I gave the tostadas an “Excellent” rating and the girls gave them a “Very Good”. 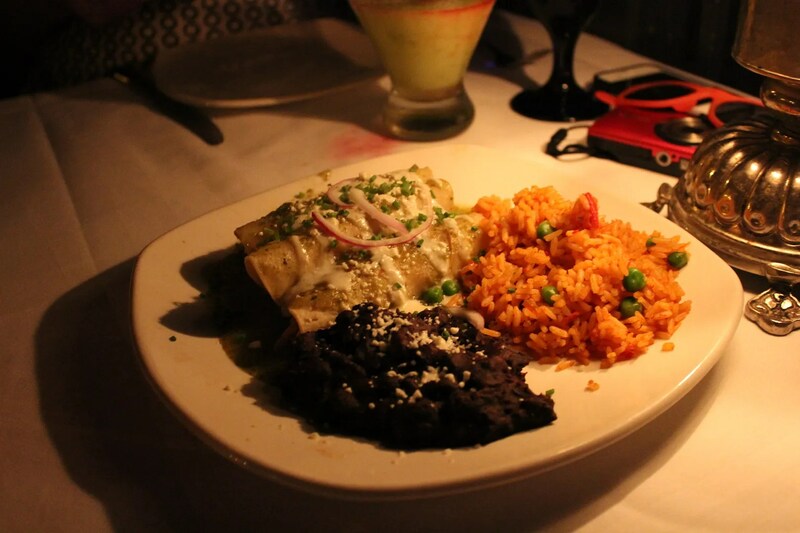 Enchiladas Verdes de Pollo – Corn tortillas filled with pulled chicken, covered with green tomatillo sauce, topped with sour cream, queso fresco and onions, served with rice and black refried beans. We both enjoyed these very much and gave them a “Very Good” rating. Oh, and the rice and refried beans were pretty good as well. 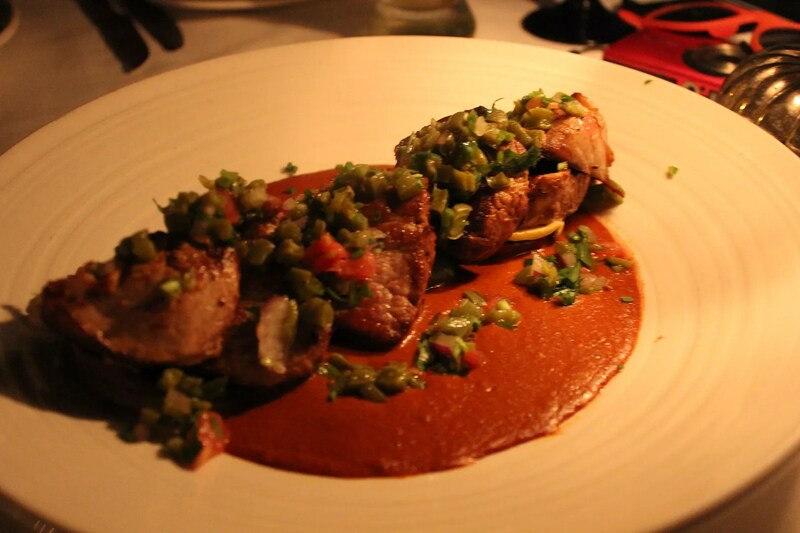 Lomo de Puerco en Pipián – Pork tenderloin served over roasted vegetables and “pipián” (pumpkin, chiles and almond sauce). I was a little surprised when she ordered this, as it seemed a little bit outside of her comfort zone. She thought the pork was very good, but wasn’t real wild about the “nutty” taste of the sauce so gave this an overall rating of “Good”. And for the record, she does not like nuts…of any kind. Nothing really appealed to us from the dessert menu (sadly, they no longer have the Moras con Cajeta) so we decided to go to the French bakery to satisfy our sweet tooth. 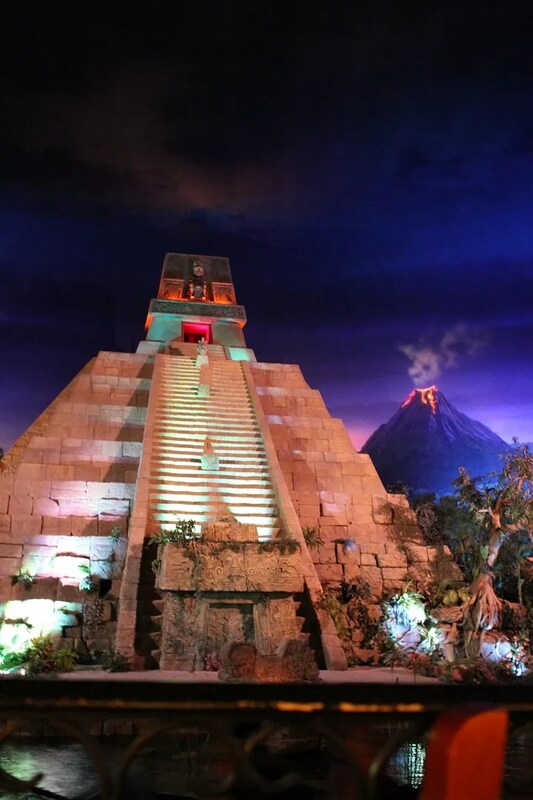 San Angel Inn remains one of our favorite Epcot restaurants, behind only Le Cellier. And well, maybe Teppan Edo too. 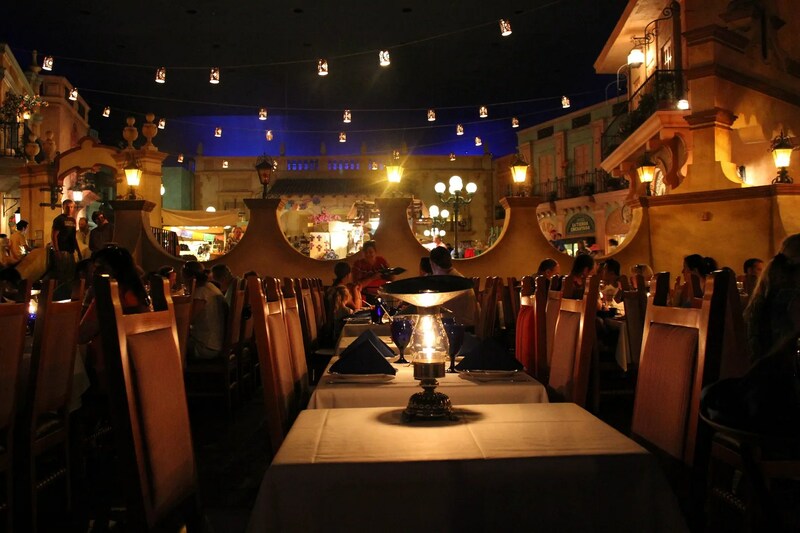 So it is our 3rd favorite Epcot restaurant, I think.